White Plains, NY – February 4, 2019: The Harlem Fine Arts Show (HFAS), presenting a broad collection of work (paintings, photographs, books, jewelry, and sculptures) by African and African American artists, returns to White Plains for its 8th year. The Annual Event will take place 6:00 p.m.to 9:00 p.m., Thursday, March 28, 2019 at the Reckson Metro Center, 360 Hamilton Avenue, in White Plains. Dr. Belinda Miles, President of Westchester Community College. Music will be provided by Jasper Cain and the Rhythm Collective. Admission is $30 per adult, $10 for students with college ID, FREE for youth 18, and younger. 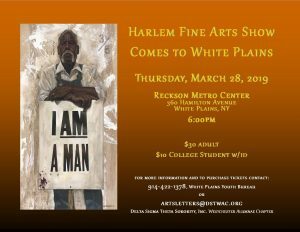 The White Plains Harlem Fine Arts Show is sponsored in collaboration with the White Plains Youth Bureau (Frank Williams, Jr. Executive Director), Delta Sigma Theta Sorority, Inc.- Westchester Alumnae Chapter (Danielle Henry, President), and the Harlem Fine Arts Show (Dion Clark, Founder). This entry was posted in Press Releases and tagged Harlem Fine Arts Show Comes to White Plains. Bookmark the permalink.